People who go to a hospital emergency room cannot be turned away regardless of how sick or injured they actually are or whether or not they have insurance. They must be seen and treated. Hospitals are sagging under the weight of the uninsured coming in to emergency rooms to get routine medical treatment. I often say, somewhat jokingly, but with a solid basis in reality, that after 5 PM I become a primary care doctor. E.R.s have become primary care clinics, especially in the evenings and on weekends, where doctors treat sniffles, coughs, colds and other relatively minor health issues — and at a very high cost. Being seen in an E.R., as opposed to a primary care physician’s (PCP) office costs much more. One of the main goals of the Affordable Care Act, also known by its slang name, “Obamacare,” was to reduce dependency on E.R.s by providing affordable care to a wider range of people who, since they had insurance, would then stop going into the E.R.s and see their PCP. That hasn’t happened. In fact, just the opposite has, according to a survey conducted by the American College of Emergency Physicians. In a 2015 survey of E.R. docs the American College of Emergency Physicians conducted, 28% of respondents, who were emergency room doctors, said the volume of patients using the E.R. increased greatly while 47% said the volume has gone up slightly. That’s 75% of respondents who said the volume has gone up, either greatly or slightly. Costs have gone up, as well. The American public in general has felt the increased financial pinch associated with this trend. They’re feeling what’s known as “cost shifting,” which simply means that to compensate for patients who come to the E.R. without insurance, costs are passed along to insurance companies and the insured. Subsequently, insurance rates, treatment costs and hospital costs all go up. There are a number of issues that can be addressed immediately, without any political shift or re-writing of laws or controversy whatsoever. These things go to how E.R.s and hospitals manage patients in general. There’s a term hospitals use known as “boarding.” (no, not water boarding, that’s still highly illegal and has nothing to do with E.R. management! ), which refers to patients essentially being lined up on gurneys in E.R. hallways, triage rooms, sometimes in closets — anywhere else there’s open space. Boarding patients in E.R.s is less than desirable and studies have shown that it’s associated with poor patient outcomes — longer stays and higher morbidity rates. If you think of this issue as if the E.R. was a highway, and patients are moving along through the process of triage, diagnosing, treating and releasing (or admitting) — it just takes one or two extra patients for a traffic jam to develop once you reach about 85-90% occupancy in the E.R. Just one or two extra patients and that’s when trouble starts to develop. The more overcrowded you are in the E.R., the more patients get neglected, have delays in receiving antibiotics and/or pain medicines, get incorrect medicines delivered, and things start to spiral out of control. There was major study done recently of more than 40,000 patients that looked at boarding and how that practice related to patient mortality and length of hospital stay, and it was eye-opening. If you look at a boarding time of two hours, you have an associated mortality rate of 2.5%. When that E.R. boarding time goes to 12 hours, we see a corresponding mortality rate of 4.5% — almost double. As far as length of stay goes, when you board a patient for two hours, the associated average length of stay is 5.6 days. When you board a patient for up to 24 hours, the length of stay jumps to 8.7 days. You might think boarding for 24 hours is excessive, and it is, but it happens. When patients reach the 6-12 hour range of boarding time, that’s the turning point where things really start changing for the worse. An adverse effect of boarding also means longer E.R. stays for higher risk patients. So there’s a ripple effect throughout. It’s interesting to note that overall, when a patient is boarded in hallways in the inpatient areas of our hospitals, there’s a better outcome than when they’re boarded in the E.R. It’s imperative that we get patients out of the E.R. and upstairs into hospital rooms much faster. 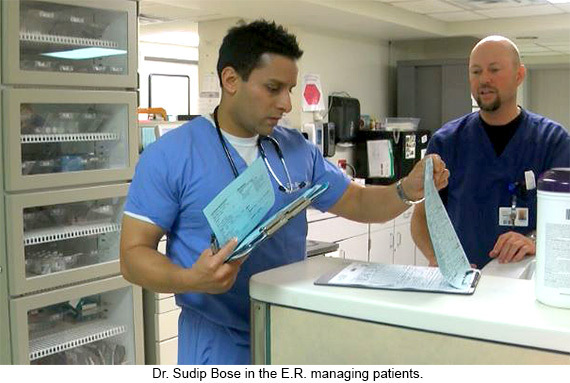 One simple solution to reducing or eliminating boarding that can be very effective is staying on top of room cleaning so patients who need to get admitted can get out of the E.R. and into the appropriate inpatient hospital bed quickly. It’s interesting how in the E.R., you can just wipe a room down with a disinfectant, pull a clean sheet of paper up over the bed and, voila!, you can bring in a new patient. But on hospital floors, you’ve almost got to call out a hazmat team to get the rooms scrubbed and cleaned and sterilized to be ready for a new patient. In the E.R., we keep hearing, “The room’s not cleaned!” from inpatient departments. We’ve got to develop a way at our hospitals to instantaneously track available bed information so we can maintain smooth transition from E.R. to inpatient bed. A monitor in the E.R. that shows us exactly what beds are available and in what departments would be a huge step forward —it would give us instant monitoring. Better management and better tracking of patients can help streamline their hospital stays and relieve some of the burden of docs, nurses and other staff throughout the hospital in managing the enormous demands that our nation’s E.R.s are facing.